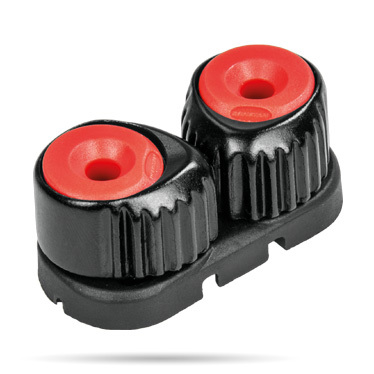 Intensive development efforts have produced this high performance range of cam cleats that provides unbeatable holding power while allowing easy cleating and releasing of control lines and sheets. Aluminium cam models built for ultimate durability where high wear and high loads are encountered. Cams are hot-forged and hard anodised for maximum strength and corrosion resistance. Ronstan Alloy Cleat™ models are available in sizes small and medium. The medium cleat is built on an aluminium base for maximum rigidity whilst the small cleat has a composite base for an optimum blend of lightness and durability. Self lubricating, self-cleaning slotted bearings provide lower frictional resistance, quicker response times and superior resistance to sand and salt than ball bearings which can deform under load. The multi-coil spring recessed in the upper part of the cam generates near constant torque. This consistency ensures secure cleating of even the smallest lines with minimal abrasion or rope wear. Low effort line entry and exit due to unique teeth and entry geometry. Small cleat has a base produced from long fibre reinforced polymer to save weight while providing essential stiffness. A comprehensive range of specialist cleat accessories allow customisation of the cleat set-up to optimise performance by controlling inward lead, outward lead, cleating and uncleating angle and height. Swivel cleat bases further enhance the function of cleats providing articulation, and with some models setting of cleating angle and direction (up or down cleating) to allow control of lines and sheets from various positions on the boat.